Microsoft Teams is advertised as a “chat-based workspace” that enables organisations and their employees to achieve an increase in productivity. This is delivered through the use of an application that brings together people, conversations and content. 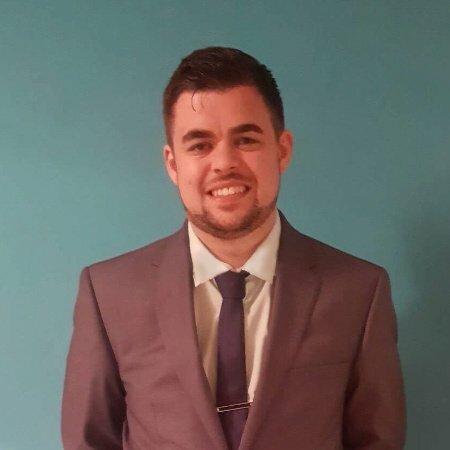 Having recently been involved in a number of Microsoft Teams demonstrations, I felt that it would be of benefit to group a number of interesting features to assist in user engagement and adoption of this great product. Please note that Microsoft Teams does provide a detailed Help Centre which is worth a read through for more information. This is more of a warning versus a feature, to begin with. It is critical for successful Microsoft Teams implementations alongside all other SharePoint development. Please be aware that for every Team generated, a corresponding Office 365 Group Site is created which is its own Site Collection. On too many occasions I have witnessed a number of Site Collections generated through users creating Teams at any given opportunity without proper training and/or best practice guidelines. Potentially this can provide barriers as users will become confused as to where they are storing content. For example, developing a highly structured Document Management System is not good value if users suddenly save 50% of their documents within Teams instead! 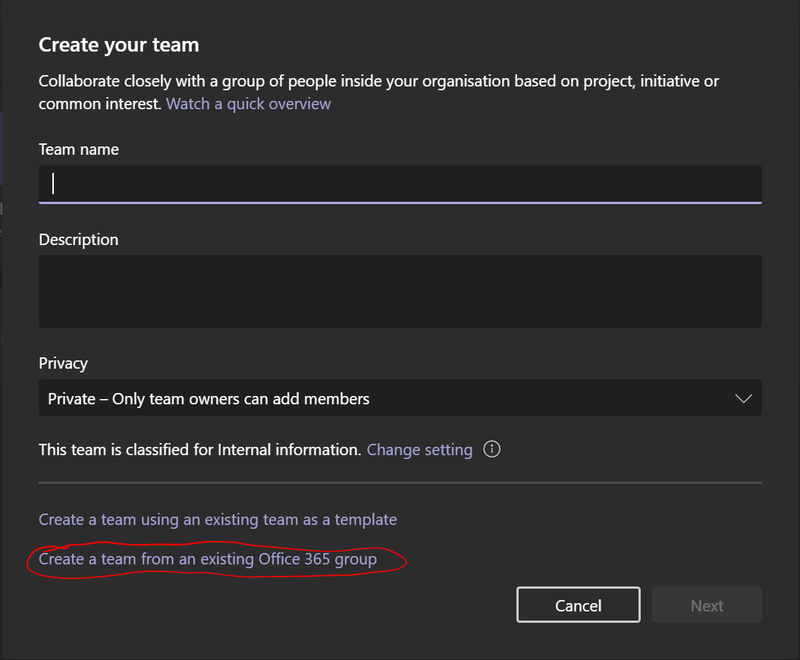 Best Practice is to create your Office 365 Group when required, then create a Team from the group using the relevant link when clicking to “Join or Create a Team”. Much like Outlook; Microsoft Teams enables users to perform mentions through the use of the @ symbol. This allows you to mention a member of the Team e.g. “@Joe.Bloggs” and ensures that they are notified of the message. You can also mention a Channel e.g. “@SharePoint Modern Experience” which ensures that all Team Members are alerted of the message. 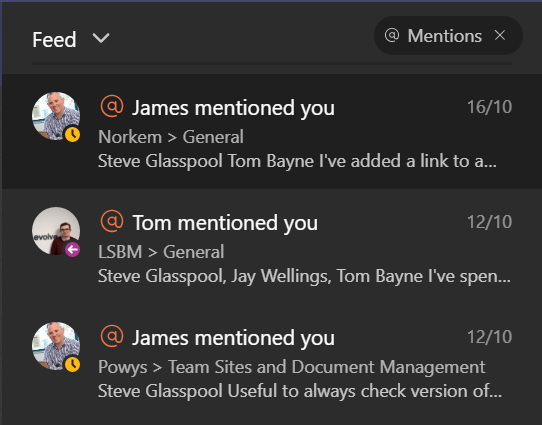 Users are alerted of Mentions either via the Teams Application flashing on there toolbar, through the use of the Activities Window which can be filtered to only showcase mentions and via the @ symbol and highlights that appear alongside conversations. An issue that impacts me on multiple occasions (I never learn!) is that the use of the Enter/Return key. By pressing this button, it will automatically send your message before completion. This can be avoided by ensuring that you press Shift and Enter/Return to move to the next line. Although, another option is to click on the formatting icon below the conversation box, to allow you to structure a much longer message. Much like you would for an email. There are various formatting features available in this window. As well as the ability to press Enter/Return multiple times without sending confusing half messages to all your colleagues! Frequently you will receive a number of messages which contain knowledge that you require to save for later. Additionally, you may even require your input for an action. 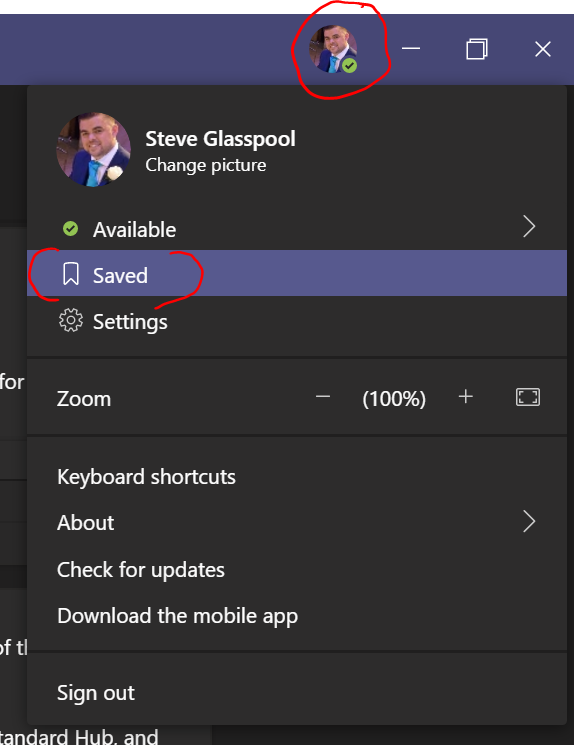 Microsoft Teams allows you to save these messages through the use of the bookmark icon alongside the conversation. These messages can then be accessed at a later date. However, unfortunately, they are not easy to locate at first glance. To access these messages you can locate them within the menu which becomes available when clicking on your profile picture. This can be found in the top right-hand corner of the Microsoft Teams Application. When creating a conversation within the formatting view, you have the option to mark a message as being “Important”. The same as what is available within Outlook. Note that the message will be highlighted at all times in red and will be labelled as “Important!” so as to stand out amongst the general conversations. Tabs can be created to host a number of different sources of data. From displaying an embedded document, through to full Power BI Dashboards. When adding new tabs, you will be given the option to generate a tabbed conversation. This will create grouped conversations within the Team but will also provide a view alongside the discussed material. It is good to note that moving between Channels and Teams during the conversation creation, does not impact your work. Navigating back to the conversation that you had begun to write will allow you to progress with the post from where you left off. Microsoft Teams hosts all conversations, which is great in allowing users to backtrack through a Channel. However, it is also possible to copy a conversation link to be provided to other users allowing them to jump directly to a specific thread. Every Team Channel provides an email address that can be utilised if you wish to email content to the Team. This is of most benefit when receiving an email that warrants further discussion with your team members, without causing too much email overload. Standard working practice would be to forward an email on to numerous colleagues and then try to collate all the answers/feedback. This approach can quickly become out of control and responses may be lost. Creating a conversation ensures that all this correspondence is grouped in a single easy to locate area. You are able to select your favourite Teams and manually order them on the left-hand panel in the application. However, to view all Teams in alphabetical order and to search for Teams, you need to use the Gear Icon at the base of the screen. This is a really useful page which is not obvious at a glance. 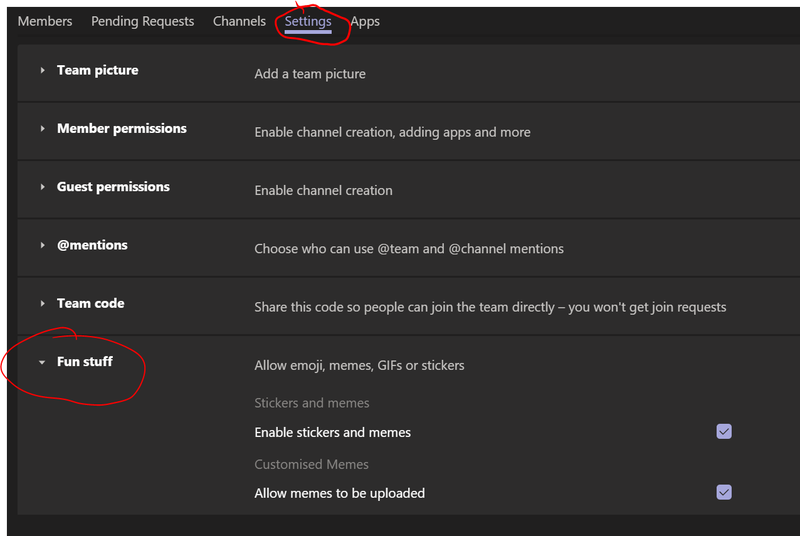 It is beneficial to frequently check the “Join or create a team” link at the base of the application, as any Microsoft Team that is setup as public can be joined. In large organisations, this may consist of multiple Teams relating to interest areas and/or social events. When adding members to your Microsoft Team you are able to add guest accounts, through sharing with Microsoft emails (as you would when externally sharing on SharePoint). Please ensure you check with an administrator to see if this functionality is available. Also, understand the rules in place within your organisation to protect documentation and data. Using the icon set, below conversations you are creating, will enable users to add emojis and customised Memes to their chats. This can be utilised as a bit of fun and inject some humour into discussions. For some organisations, the use of the humorous elements will not fit within the brand and culture. Specifically as the discussions may not warrant the more “social network” approach. If this is the case then these elements can be switched off within the settings menu on a per Team basis. This menu can be accessed through the Team Ellipsis Menu. 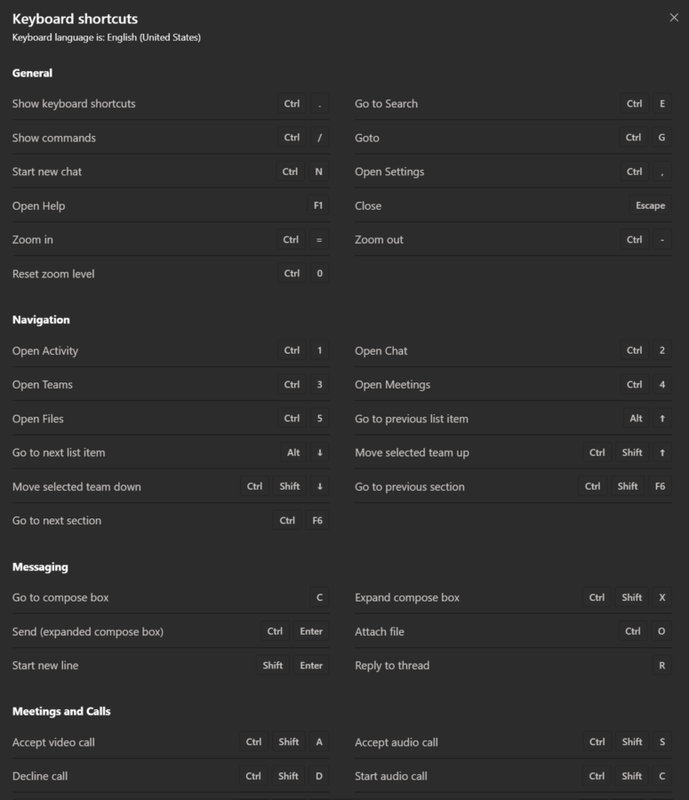 Microsoft Teams provides a variety of keyboard shortcuts for those users who prefer to work in that way. Pressing CTRL and the “full stop” ( . ) key will bring up the full menu to learn. 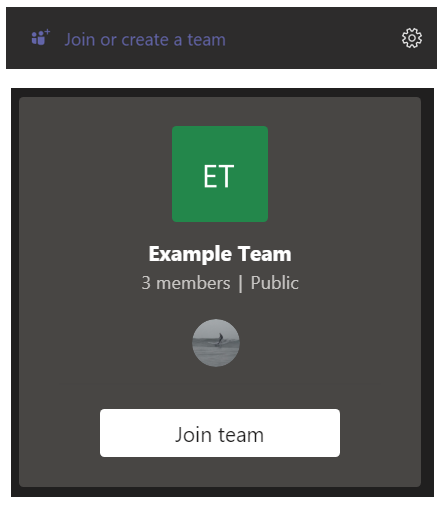 Microsoft Teams provides a Light, Dark and High Contrast Theme for users to select. These are available within the settings menu accessed via your profile picture. Microsoft Teams offer a wide variety of functionality and features to help improve communication. Microsoft Teams also continues to grow and following the Ignite Conference, there are a number of upcoming new features. An overview of these can be found here. The functionality that I have discussed within this blog post is not exhaustive, so I would advise for you to explore further and locate methods of working that make you and your team more efficient. previous post: 60 Second Briefing: What is PowerApps?